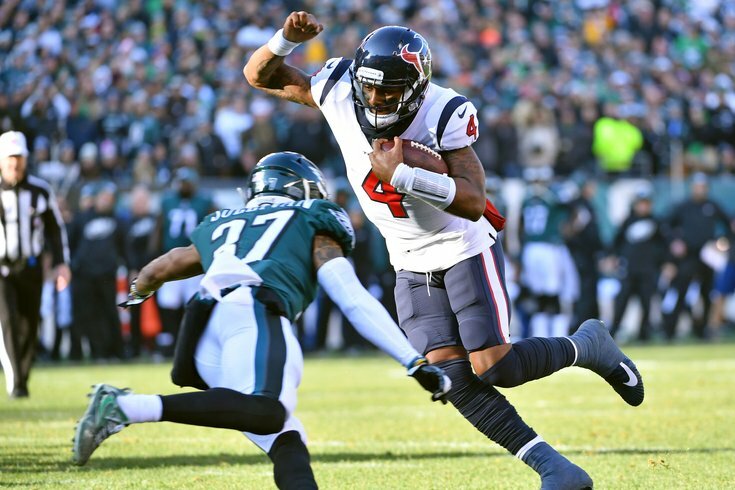 Houston Texans quarterback Deshaun Watson cuts past Philadelphia Eagles defensive back Tre Sullivan on a 5-yard touchdown run during the second quarter. After a huge upset win over the Los Angeles Rams last Sunday, the Philadelphia Eagles' playoff hopes were renewed, as they still have a shot at getting in if they take care of business against the Houston Texans on Sunday, and the Washington Redskins Week 17. As we noted in our five matchups to watch, the Eagles' greatest strength, their defensive line, should create problems for the Texans' biggest weakness, their defensive line. Carson Wentz aside, the Eagles' biggest injury issues this season have occurred in their secondary, where they will be without four of their top five defensive backs, in Jalen Mills, Ronald Darby, Rodney McLeod, and Sidney Jones. The Birds should have their hands full with star receiver DeAndre Hopkins. Here are the Eagles' and Texans' inactives, with analysis. The Eagles are currently 2.5-point favorites. Here's who PhillyVoice's staff is picking, as well as other writers from around the country. In case you missed our non-Eagles rooting guide, in addition to winning their last two games, the Eagles need help from around the league to get into the playoffs. Most notably, you should be rooting against the Minnesota Vikings, Dallas Cowboys, and Seattle Seahawks. Here are the rest of the games around the league.